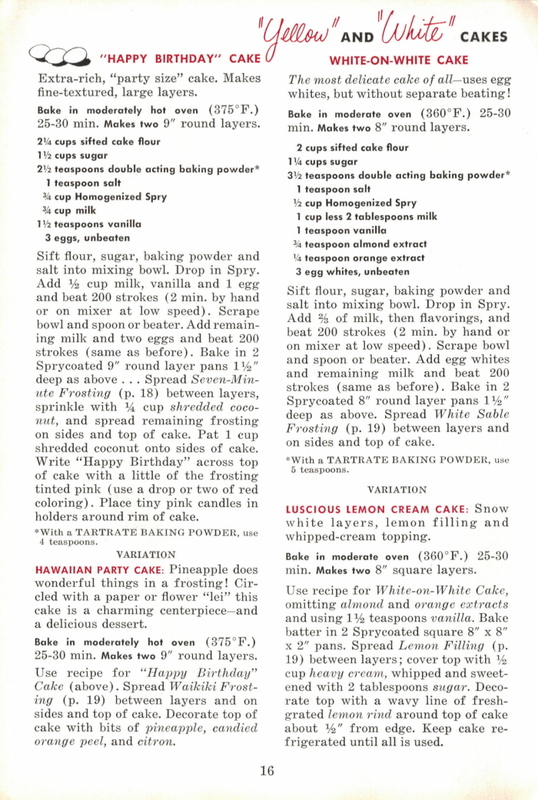 Here is page 16 of the vintage cookbook: Home Baking Made Easy that was published in 1953 by Lever Brothers Company. Extra-rich, “party size” cake. Makes fine-textured, large layers. Bake in moderately hot oven (375° F.) 25-30 min. Makes two 9″ round layers. Sift flour, sugar, baking powder and salt into mixing bowl. Drop in Spry. Add 1/2 cup milk, vanilla and 1 egg and beat 200 strokes (2 min. by hand or on mixer at low speed). Scrape bowl and spoon or beater. Add remaining milk and two eggs and beat 200 strokes (same as before). Bake in 2 Sprycoated 9″ round layer pans 1 1/2″ deep as above . . . Spread Seven-Minute Frosting (p. 18) between layers, sprinkle with 1/4 cup shredded coconut, and spread remaining frosting on sides and top of cake. Pat 1 cup shredded coconut onto sides of cake. Write “Happy Birthday” across top of cake with a little of the frosting tinted pink (use a drop or two of red coloring). Place tiny pink candles in holders around rim of cake. HAWAIIAN PARTY CAKE: Pineapple does wonderful things in a frosting! Circled with a paper or flower “lei” this cake is a charming centerpiece–and a delicious dessert. Use recipe for “Happy Birthday” Cake (above). Spread Waikiki Frosting (p. 19) between layers and on sides and top of cake. Decorate top of cake with bits of pineapple, candied orange peel, and citron. The most delicate cake of all-uses egg whites, but without separate beating! Bake in moderate oven (360° F.) 25-30 min. Makes two 8″ round layers. Sift flour, sugar, baking powder and salt into mixing bowl. Drop in Spry. Add 2/3 of milk, then flavorings, and beat 200 strokes (2 min. by hand or on mixer at low speed). Scrape bowl and spoon or beater. Add egg whites and remaining milk and beat 200 strokes (same as before). Bake in 2 Sprycoated 8″ round layer pans 1 1/2″ deep as above. Spread White Sable Frosting (p. 19) between layers and on sides and top of cake. 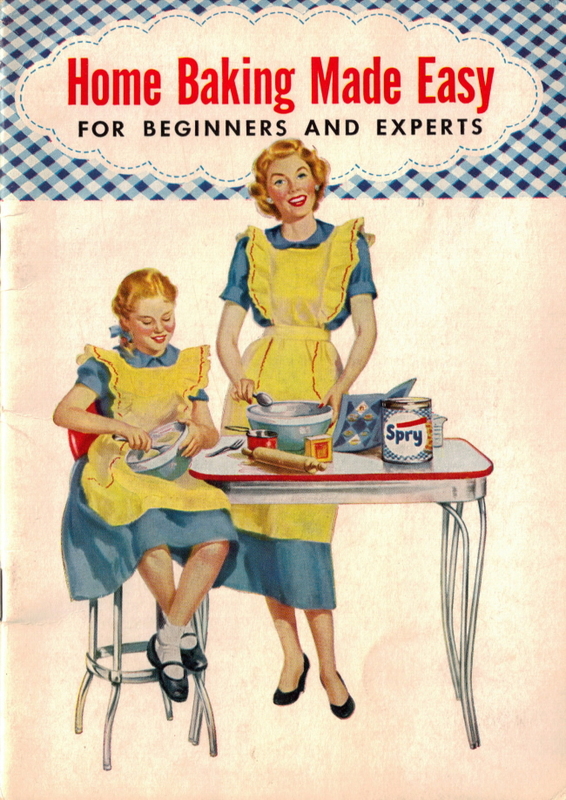 *With a TARTRATE BAKING POWDER, use 5 teaspoons. LUSCIOUS LEMON CREAM CAKE: Snow white layers, lemon filling and whipped-cream topping. Bake in moderate oven (360° F.) 25-30 min. Makes two 8″ square layers. 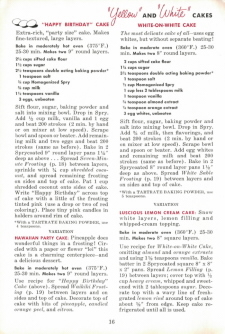 Use recipe for White-on-White Cake, omitting almond and orange extracts and using 1 1/2 teaspoons vanilla. Bake batter in 2 Sprycoated square 8″ x 8″ x 2″ pans. Spread Lemon Filling (p. 19) between layers; cover top with 1/2 cup heavy cream, whipped and sweetened with 2 tablespoons sugar. Decorate top with a wavy line of fresh-grated lemon rind around top of cake about 1/2″ from edge. Keep cake refrigerated until all is used.